Our oven cleaning in Angel service is considered in accordance to the highest quality standards. It is used by both local residents and establishments such as restaurants, diners and canteens. We deliver a high quality solution for domestic and commercial customers alike, and the tons of outstanding reviews that we receive on a regular basis are a proof of this simple fact. Maintaining an oven well sanitised is not an easy task. In reality, it is ranked among the toughest chores out there, so it is always better to leave it to the professionals. Even if you do not have our licensed and vetted cleaners come over every week, making use of our oven cleaning in Angel service at least once every three or four months. This will remove all build-ups and make the appliance much easier to maintain. Prepare the food for you and your family in a clean, hygienic environment. This will make it not only taste better, but healthier too. By using tested methods and state of the art equipment we will make sure that your oven look as if it has just come from the store. Grease, food spills and other forms of dirt do not stand a chance. We can come to your home or restaurant at any time that would be best fitted toy our own personal schedule and finish the task that you have for us quickly, without causing any strain, strain or hassle. Please take not that the minimal charge for a sanitation job with us is £45. But you will not have to pay much more, because we offer attractive and very appealing discounts too: for example, a single oven and hob extractor sanitation will set you back merely £75 – less than what you can traditionally find being offered on the market at the current moment. 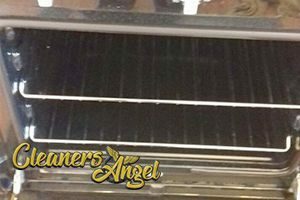 In case you would like to receive further details on our oven sanitation solutions, or you would like to get to know our Angel based and operating team a little better before hiring us, please do not think twice about getting in touch with our friendly and very helpful around the clock customer support. Our experts are to be reached both via phone and email, and they are authorised to issue free no obligation quotes to anyone interested in our services. Unless there are changes in the specifics of the cleaning job, the price you are told in advance would be the one to pay upon completion – no additional taxes and hidden charges – we firmly believe in transparency above all.